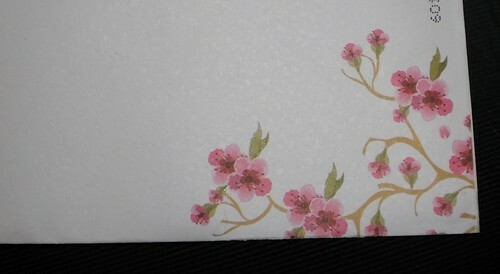 In the mail on Thursday was a large envelope from my daughter. Lovely trim on the edge, don't you agree? With Valentine's Day approaching, I thought maybe she was early this year. Smart girl, get them all out now so you don't forget, something her mom really should do. Oooh nice little seal on the back, too. When I opened up the envelope, it was not a Valentine. It was the long awaited invitation to the "Blessing of the Vows" ceremony in May. If I'd been a bit more observant before I tore into the envelope, I would have noticed the stamp was quite unique and probably would have given me a clue to the envelope's contents. I think, so far, this has been their 2nd biggest expense behind Carole's dress. I know she and David thought long and hard about these. But, as Pam said, this reflects my daughter. Late May, in Virginia, where, in theory, things will be in bloom and the air will be warm and the day could be gorgeous sunshine. 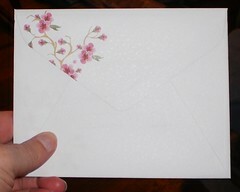 Their colors are shamrock green and pearl and the ribbon isn't really a shamrock green, but it so fits the invitation. Next step is returning the enclosed response card. I dropped mine in the mailbox at the post office on Saturday. I suppose I didn't have to, it might be assumed I'm coming, but manners dictate that one respond if one is invited. I got the days off I requested for this wedding approved. Now, do I want to fly or drive? Oh this reminds me of my friend Marie. When her middle daughter, Angela, married, she was getting ready for work one day. Now Marie is blind as a bat without her glasses but it's morning. She saw the RSVP card on the counter and thought she really should send it back. So, she grabbed it and the closest writing tool was a felt tip marker. 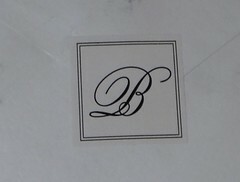 She checked the box, sealed the envelope and dropped the card in the mail. Four days later she got a call from Angela. "Um...mom? Don't you love us?" "Of course I do. What makes you say that?" "Because your RSVP card has 'will not attend' checked." I wondered when the minister made a joke about how Angela and Michael got married 'in spite of his parents not coming to the ceremony'. Angela said they saved the whole envelope in their wedding album and it makes for quite the story. 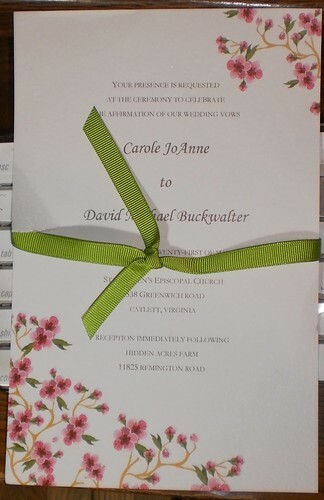 Deb here: For the record, I made sure I checked the "will attend" when I sent back Carole and David's card.